Pentax has just announced news of its latest entry-level DSLR cameras – the K-x range. The camera company has decided to add a splash of colour to the series, and has made the Pentax K-x available in blue, white and red as well as the standard black. While the K-x looks just like the K-m, there have been some improvements made under the bonnet, notably a two megapixel increase in sensor size to a 12.4MP CMOS, and the inclusion of Live View on its 2.4-inch LCD. Also, there is the addition of a 720p 24fps HD video mode. All the usual shake reduction and face detection is present, as well as 11-point autofocus, 16 visual effects filters and a cross process mode. Pentax has opted to power the camera using AA batteries, but the company assures us you can get about 1900 images out of the charge. The camera has a release date later this month, with prices starting at £600 with an 18-55mm DA L lens. There is also a double lens kit with the 55-300mm optics retails at £750. Price-wise, this makes the Pentax K-x one of the cheapest video-enabled DSLRs on the market. 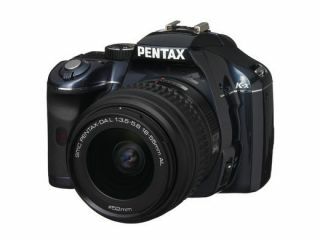 Go to www.pentax.co.uk for more details.